The last day begins with a light-hearted prank to ease the nerves. All teams showed up to their homes with graffiti. Here we can see Stevens discovering "Team OC" written on their window. Every team had a different schools name as a joke. It was water based so it came right off. Today marks the end of the Solar Decathlon and public tours, so the event organizers planned a breakfast for all the decathletes! After the assembly was over, they still had half the amount of food that they had prepared. I think they prepared enough to cover every teams decathletes, but the majority of each teams students were not present. Most of the teams assembly team had left before the competition had began (like Team Alfred's), and because the awards were already handed out the day before, most of the members from various teams stayed in bed to catch up on some sleep before the last day of public tours. More awards! I seem to have lost my image of the awards (and the SD website never posted and photos from Sunday). All teams were given awards for all competition sub-categories such as Comfort Zone, Commuting and Appliances. All teams also were also handed a wooden finalist plaque. Originally there were to be twenty teams in this contest, the 6 that dropped out obviously did not finish the contest. I do however have pictures from the event patrons as they received their awards. These people showed exemplary ambition in their related areas. These being communications, construction, public volunteering and rule keepers, to name a few. 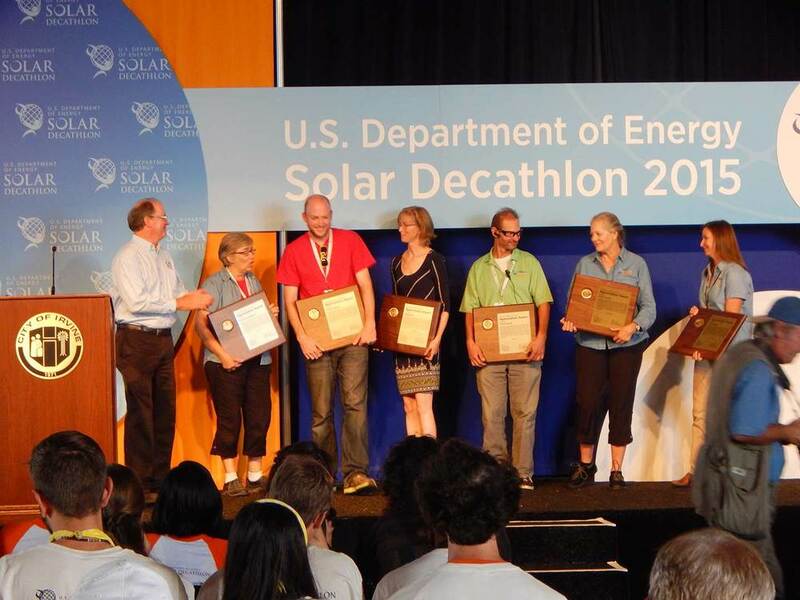 One of these award recipients was Joe Simon, competition manager of the U.S. Department of Energy Solar Decathlon 2015. Joe was always riding around the Solar Decathlon Village on his bicycle, goes to and from different teams in order to keep the contest running smoothly and correctly. I spoke to him on several occasions while we were both waiting for something. Joe Simon, competition manager, posing in front of his newly purchased sculpture with the artist, Bernard Aaron Dolecki. Joe Simon would later come to Team Alfred's house to trade us shirts and to also buy my golf tee sculpture, Opposing Forces. Today the Alf House seen over 2,000 last minute visitors! We also ran out of our original 5,000 printed pamphlets. The day was filled with great visitor feedback and some group photos. Myself and Dr. Clark speaking with visitors in the entrance way. I made it my prerogative to keep the house clean and tidy every day of the competition. The house represents my alma matter, but also is my personal art show space. Not mentioned before is the electrical wire wound up on the ceiling. This was to be for our diningroom light that was a wooden CNC cut Team Alfred logo. It broke in shipping, so it was never put up. Team Alfred's Dinnerware Set with fruit and display binder. Volunteers and staff alike are always seen visiting some of the homes on their free time. Jess Scoones opens up the couch to show visitors the storage space underneath when two kids decide it would be fun to hide inside. Myself answering questions in the back hallway while Jess Scoons relaxes more on the couch. First noticed is Dr. Clark on the phone with Alfred State, but also seen are students giving tours inside the house while visitors outside (in reflection) are looking in. Heading over to Saeed on the last day for a photo, Saeed snaps a few quick action shots of Avery and I. Group Photo in front of Poster Display! Avery Sandler, Saeed Azad, Bernard Aaron Dolecki and competition manager Joe Simon. 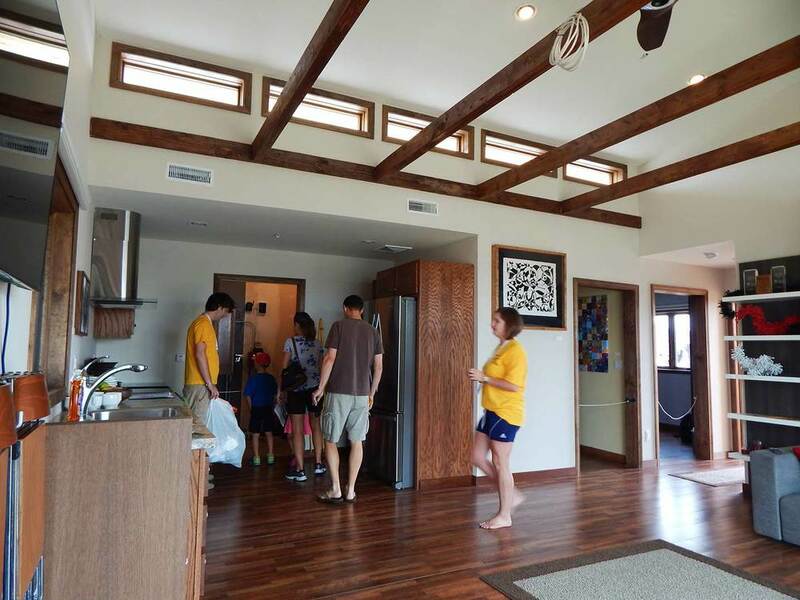 As visitors still wander through our home, our team leaves the Solar Decathlon Village for the last time. At 2pm or so I began pulling out my art crates from under the deck to begin packaging up my unsold works to be shipped back to New York. I ended up selling four out of my eight works on display; none of the ceramic works sold. After I packaged my work, and the other teammates packaged the ceramic wares, Avery took what was left of our students to the airport for our return trip home. At John Wayne Airport we got past security and waited for two hours for our flight to New York City. After a long six hour flight we made it back, only to wait 5 hours in the airport for our one hour connecting flight to Rochester. It was a long grueling trip home, as none of us slept much on the plane rides nor on the cold hard airport floor in Newark. In the end it was totally worth it for the amazing experience we all had the pleasure of being a part of. There is not a whole lot more to be said than what has already been said. It was a crazy week filled with stress, drama as well as happiness. For a small community in the hills of western New York, this solar house has become a testament of our school's knowledge, skill and ongoing courage to strive for a better tomorrow. Surviving the torturously long trip back home, the remaining students get on a university bus bound for Alfred. If you have any questions or comments, please contact me directly.